An hour of spicy stand-up comedy with top international comedians right here in Paris. Come and laugh at everything under the sun, (but mostly at France and the French!) No songs, No dance, No curry, Only jokes! 99% English 1% French. Happening in an underground cabaret by the Sacré-Coeur. * Entry with one drink minimum at the bar. Exit with cash tips for the comedians! 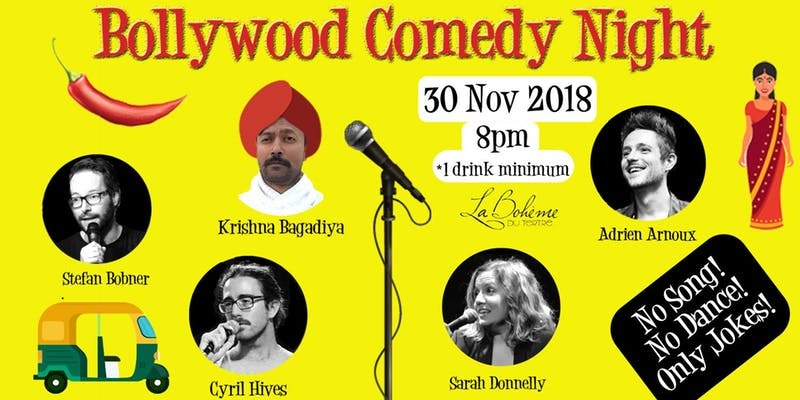 Krishna teaches the French how to speak English in the day, and in the evening he makes jokes on being an Indian in the land of Cheese and Striped clothing. Show is free with a drink of 7 euros at the bar to pay for the venue. Cash tips for the comedians at the end of the show are welcomed.